Propagation of African Violets is a slow process, but it will produce more plants that you can use as gifts or to beautify your surroundings. Here’s how it’s done. Select a large, healthy leaf from the plant you want to propagate and remove it. Cut the stalk of the leaf down to approximately 1 1/2 inches long. Dip the leaf stalk into a cup of water and then into rooting hormone powder. The powder will probably clump. Tap the stalk lightly so that a only a thin coating of powder remains. Moisten a small pot of potting mix and insert the leaf into the pot about 3/4 of an inch deep. Insert the entire pot into a plastic bag and keep the leaf in bright but filtered light. Artificial light also works well for African Violet propagation. Water the pot 7 to 10 days later, and from then on water just before the potting mix completely dries out. Begin uncovering the plants when plantlets appear around the leaf. Uncover the plants gradually until they are completely out of the bag. Plantlets will begin appearing in approximately four weeks. Pull new plants away from the leaf when they are approximately 2-inches tall and move them into separate pots. Leaves will produce up to four plantlets. The African Violet propagation process will take about two months. Propagate a dying plant by selecting the healthiest remaining leaf to ensure you have a copy of your plant. Trade African Violet propagations with your friends to give you more of leaf structures and bloom colors. 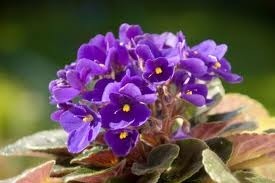 Beware of copyright laws covering some African Violets. If an African Violet is copyright protected, there will be a warning label on the plant saying propagation is prohibited.